The Inguinal Hernia consists of the escape of a bowel or part of it through a weakening of the anatomical structure that contains it. In the case of the inguinal hernia, the physical defect is to be found in the degeneration and weakening of the inguinal inner ring (external oblique hernia) or the back wall of the inguinal canal called transversalis fascia (direct hernia). The aggravation process is sadly constant, it can be faster or slower and a surgical surgery is always required for the healing. Many people who suffer from inguinal hernia, crural hernia and diastasis are reluctant to deal with the problem. Many people who suffer from inguinal hernia, crural hernia and diastasis are reluctant to deal with the problem. If the inguinal hernia is not treated early with surgery, there is a real risk that the development of the disease may even lead to hernial throttling, which results in the gangrene of the part of the intestine that comes out through the hernial orifice. This serious complication must be treated as a matter of urgency with surgery that is much more invasive and riskier than that required for a simple inguinal hernia. Many patients are misinformed about the appropriate time to operate their hernia. Often, out of fear of coping with the intervention or the pain (immediate or post-op), the patient waits too long and wastes precious time in hoping for the effectiveness of various popular and widespread remedies (hernia belt or various gymnastic exercises available on unreliable sites) that can even aggravate the pathology or inflame the tissues, compromising a future surgical intervention. Other people, on the other hand, tend to delay surgery because they underestimate the symptoms of inguinal hernia.. The severity of an inguinal hernia, in fact, is not directly proportional to the severity of the symptoms. There are large, non-symptomatic hernias or small, even hidden, invisible hernias, which can result in hernial throttling and very serious complications if left untreated. However, what are the symptoms of an inguinal hernia? Often, during an effort, a burning sensation is felt in the groin, followed by a sense of swelling in the following days. This can regress and no longer appear for several months, but in fact the anatomical defect persists. As the disease develops, the hernial sac expands further and further. This phenomenon is perceived by the patient as a swelling or an asymmetry of one groin compared to the other. At this stage you often don’t feel much pain but, more than anything, a sense of swelling and often those affected develop the (wrong) belief that it is possible to live with this disease. 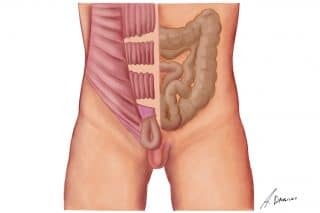 Other very insidious symptoms that are generally not directly related to the inguinal hernia, but are the consequence of it, may be evacuation difficulty, nausea, vomiting or abdominal pain. These symptoms are indicative that the intestine may be clutched in the hernial sac and transit hindered. With modern minimally invasive robotic or laparoscopic techniques the convalescence is very limited and reduced to few days. The inguinal hernia surgery, on the other hand, involves a much longer convalescence when performed with traditional open-air surgical techniques. The most advanced surgical techniques for treating inguinal hernia today are TAPP and Robotic TAPP. These two techniques consist in inserting a much softer mesh to repair the tissues and in positioning it through millimetric accesses under the guidance of an optical fibre, or of a particular and evolved Robot. The final result is the repair of the groin without the classic cut. It will be possible to shower immediately, while the following days the patient will be allowed to work and do physical activity. A further application and advantage of TAPP and R-TAPP laparoscopic and robotic interventions on the groin concerns the treatment of recurrences of inguinal hernia resulting from previous surgeries using classical surgery. A patient who has a hernial recurrence, in other words the return of the inguinal hernia after recent or even after years of traditional surgeries, is confronted with the problem of re-intervening on tissues already modified and altered by the previous surgical cut. In this case, minimally invasive surgery allows the patient to work on tissues that are still undamaged in a different anatomical surface, reducing the risk of operating lesions again and decreasing convalescence and post-op pain. Many people with hernia before planning surgery are convinced that the minimally invasive surgeries, being less traumatic, are more prone to recidivism or that the tightness of the mesh is reduced. This fear is totally unfounded. On the contrary, it is exactly the opposite. In fact, the mesh placed internally with the minimally invasive surgery TAPP and R-TAPP is held in position by the abdominal pressure itself in the first post-op days until complete integration and absorption in the tissues that contain it. The more pressure the abdomen generates, the more the mesh is held in place. The mechanism is similar to the bathtub cap: the more water is in the bath, the tighter the cap is held in place. Conversely, a large number of fastening devices and sutures are required at the front to hold the surgically positioned meshes in place. Is it possible to drive after inguinal hernia surgery? One question which is frequently raised during convalescence is whether it is possible to drive after hernia surgery. With minimally invasive techniques, driving is generally allowed as soon as the patient is released, as the patient is perfectly able to carry out common physical activities and there are no relevant surgical incisions that may conflict with the seat belt. A great advantage of TAPP and R-TAPP intervention in the treatment of inguinal hernia is that they also reduce the risk of chronic post-op pain, as the positioned mesh does not interfere with the three sensory and pain nerves of the groin. It is also possible to associate these surgeries with the repair of any concomitant umbilical hernia or diastasis recti. These minimally invasive surgeries last about an hour for each groin (an average of 10% more time than the classic cutting surgery, for greater accuracy and meticulousness) and require an operating room with special instrumentation that is only available in some cutting-edge Italian facilities. It is also very important that the surgeon, to focus on this type of surgery, is a laparoscopic and robotic specialist, has all the necessary qualifications and is trained in the most recent training courses. The patient should not worry about the length of a hernia surgery, but rather be treated with the best possible technique by the most qualified surgeon. Another patient concern often relates to local or general anaesthesia. Some patients are convinced that the local one is safer, but this is totally wrong. In fact, it has been demonstrated that the fear and emotion of the operating room when the patient is awake is a source of general and cardiac complications. The best solution is general anaesthesia which, as compared to past decades, has evolved in drugs and modalities so as not to cause any more disorders (e.g. nausea) from the first instants following awakening. Another recurring question concerns the sexual sphere and male functionality before and after a hernia surgery. The question is more than justified and pertinent, since in the groin are located the arteries and veins that drain the testicle, the vas deferens that transports the spermatozoa, and the three sensory and pain nerves of the groin. An intra-operative lesion of these spermatic cord structures could compromise the testis, as may a particularly rigid or badly positioned mesh. On the other hand, the hernia itself can damage the same structures by compressing them, day after day, causing infertility and testicular atrophy. The various popular remedies for the inguinal hernia, such as the hernia belt, turn out to be counterproductive, by inflaming and making the spermatic cord sclerotic and fibrous, and aggravating the situation. With minimally invasive surgery, the risk of injury during surgery is minimized and significantly reduced compared to open surgery, since the surgeon’s vision is amplified by cameras and monitors that allow him to see what is unnoticeable to the naked eye. The surgeon’s work surface is not “inside” the inguinal canal but “behind” it and in this way there is no danger during the surgery of ruining delicate structures such as the spermatic cord or nerves. Finally, the mesh is softer and more tolerated than the one positioned by cutting, it does not conflict with any noble structures, metal clips or stitches are not necessary to keep it anchored. This eliminates implanted foreign bodies and post-op pain. Can everyone be subjected to laparoscopic or robotic intervention? The absolute contraindications to this type of surgery are very limited and very precise. Outside these rare cases, all patients are eligible for minimally invasive surgery. The main difficulty is to find an Italian hospital where this surgery is performed routinely by qualified personnel with appropriate instruments. Which centres offer this type of hernia treatment? In hospitals in northern Europe and the United States, TAPP and R-TAPP intervention for inguinal hernia is the standard and the first choice. At present in Italy, following public health provisions regarding hospitalization and DRG hospital reimbursements, laparoscopic or robotic intervention is practically unenforceable in accordance with the NHS for economic reasons (the operating room lasts longer and the costs of materials are significantly higher). Currently, the centers of excellence where hyper-specialized surgeons work on the topic are mainly private / elite and unfortunately not accessible to all patients. It is an argument on which it would probably be worth investing at a national level, considering that the spread of the inguinal hernia in Italy is very high (more than 120,000 cases per year). The initially higher spending on public hospitals could benefit in the long term and be balanced in terms of social costs, as there would be fewer complications for the hernia surgery population, shortening the convalescence period and allowing a very rapid resumption of work. International Hernia Care offers my professional skills, which have been acquired as a result of my stay and my qualification in the avant-garde centres of the Swiss Confederation. The systematic use of the best laparoscopic and robotic technologies and my total dedication to this type of disease, often underestimated by many doctors, are the best guarantees that I am pleased to offer my patients.